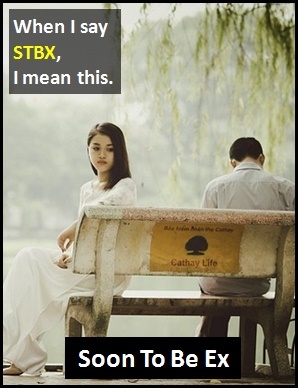 STBX | What Does STBX Mean? He is now officially my STBX boyfriend. He has just appointed his new STBX Secretary of State. "Soon-To-Be Ex" is also abbreviated as STBE. It looks like someone is an STBX. Lynne: Who's that he is arguing with? Roger: His STBX girlfriend, I think. John: Did you see that on the news about the state governor? Pete: Do you mean the STBX state governor? STBX is an initialism abbreviation. Technically, this means it is pronounced using its individual letters (i.e., Ess Tee Bee Ex). However, it is not spoken using its letters. The abbreviation STBX is used for efficiency in writing and not for efficiency in speech. Before the digital era, we would have just said "Soon-To-Be Ex" instead of using the abbreviation STBX.